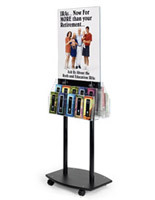 This acrylic pamphlet rack with casters is made of clear plastic with a 22” x 28” poster holder on top. 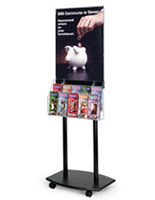 The literature display features 5 adjustable leaflet pockets on each side of the stand that will present both 4” wide and 8.5” wide brochures and magazines. 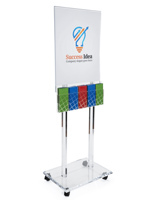 The pamphlet rack with locking wheels is able to move around, but can also become a static stand when needed. 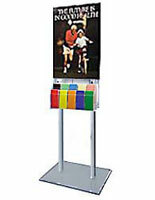 The plastic poster holder has a side-insert that makes it easy to change images out. 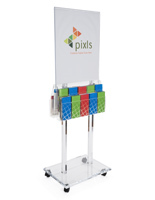 The rack features pockets on both sides that can be removed or attached easily and without the need for tools. 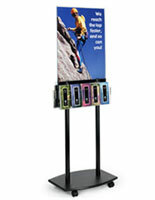 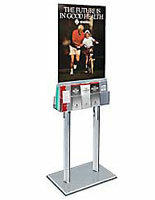 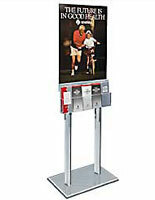 The literature display comes flat, but can be easily put together using the hardware supplied with your order.